California visitors to the Gorge were often disappointed this season. Endless heat waves and light up and down 4.7 to 5.2 winds have often been the norm. But yesterday, after weeks of unwelcome local and California smoke and hot air, we had smoke on the water and hot action. So here is a mixture of photos of regular sailors and local hotshots. Hard to believe but all these photos were shot in a 20 minute period. This speaks volumes about the intensity of the Gorge scene. I only had a cheapo pocket cam with me but still, the shots are interesting. Click on the "Recent photos: Hatchery thumbnail"
What you cannot fully see in that photo is that his board is about 24 inches long. He had NO foot straps, his toes were curled over the bow and using a tiny soft kite. 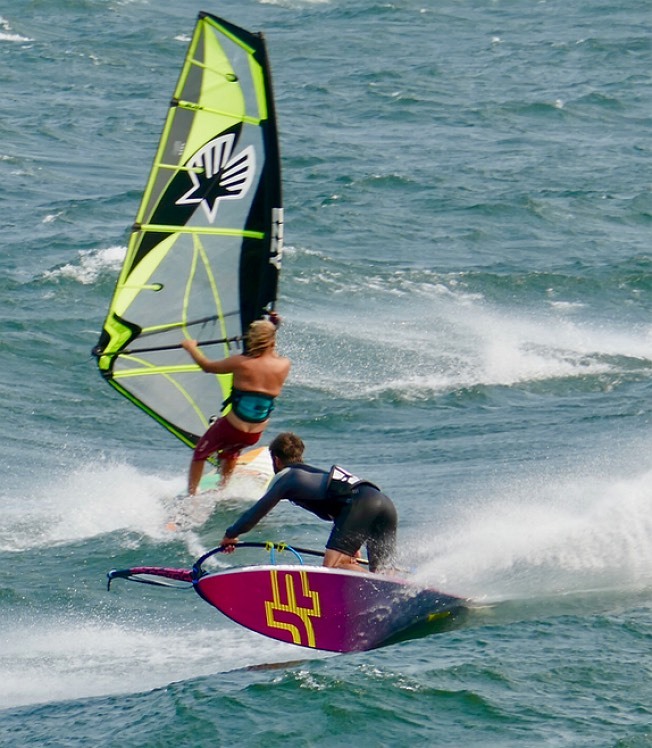 And, he was in total control as he rode huge swell and pointed at impossibly steep angles and weaved around pro windsurfers in 3.2 winds with gusts to 40. Pretty amazing. This guy's loops look like mine. That's committed baby! 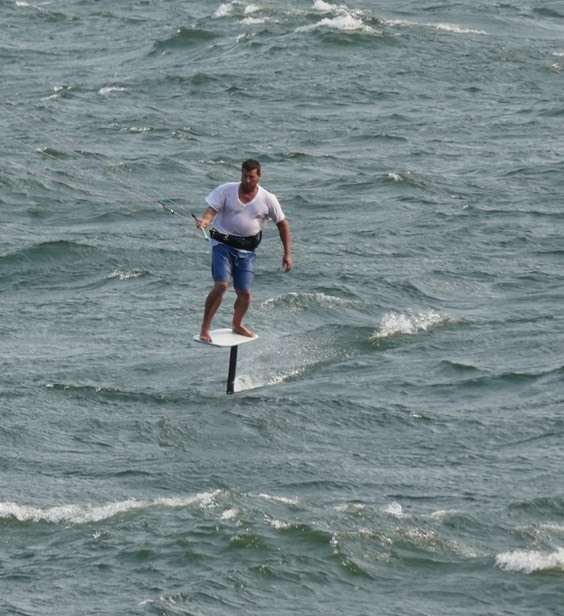 Looked like David White, windsurfing coach Peter Hart's teaching buddy? The attached pic is kinda funny: It seemed like pants is about to fall off the guy with the green sail while the guy on the JP board "laydown" for a closer look. 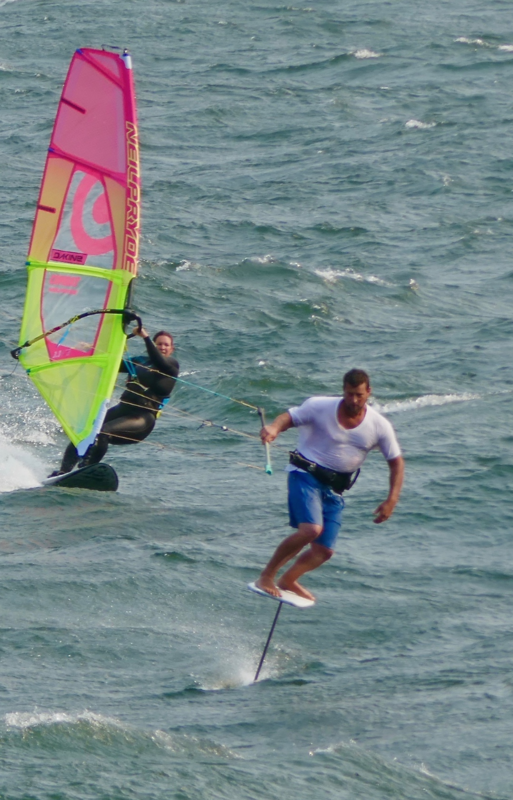 Goodwind: The attached pic is kinda funny: It seemed like pants is about to fall off the guy with the green sail while the guy on the JP board "laydown" for a closer look. Yes, I noticed that perspective which is why I posted the wide angle version of the photo so viewers would focus on the glass smooth swell and laydown jibe not the eyes and the crack. Incidentally, the first photo in this same high-speed photo series was just too provocative to post. There was an unfortunate exact juxtaposition of the mast tip and the crack which would have violated the prudish IW good taste guidelines. LOL on the lay down jibe better look comment! Give the guy a break, I understand he's a plumber. I think the guy on the JP is Tyson Poor.